Beverly D’Angelo fails to find any balls on Chevy Chase. Now it all makes sense. I’ll tell you why I hate Chevy Chase. As much as Charlie Chaplin, Buster Keaton, Groucho Marx and Jerry Lewis worked on honing their comedic craft, the talent-less drogue Chevy Chase has done exactly the opposite. Chevy Chase has now coasted for decades on a false reputation of being a “comedian” when he is so patently, empirically devoid of humor of any stripe. His acting is atrocious, at the level of first-year students who “indicate” their way through performances (“I’m feeling crazy now, so I’ll widen my eyes and grimace” “I’m feeling sad now, so I’ll droop my shoulders and pout”); his timing is so appalling, it would be considered laughable – if there was the remotest possibility of laughing at anything Chevy Chase does; his posture, his facial expressions, his delivery, his insertion into the very scene itself is so coarsely amateurish, so devoid of the joke-craft and aptitude exhibited by actual comedians, it is an embarrassment to mention those exceptionally skilled comedy giants above in the same article. And I apologize to them, their families and their estates. 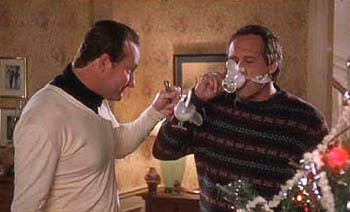 Which brings us to NATIONAL LAMPOON’S CHRISTMAS VACATION. Written by John Hughes in a meth amphetamine daze and directed ineptly by Jeremiah Chechik, the third VACATION film finds Clark Griswold (useless asshat Chevy Chase) and his wife Ellen (the glowing Beverly D’Angelo) spending Christmas at home, with their new kids (somehow, the Griswold teen kids keep transmogrifying into different people for every film – this time it’s Juliette Lewis in one of her first feature films and Johnny Galecki, long before THE BIG BANG THEORY); hosting both their sets of parents (John Randolph, Diane Ladd, E.G. Marshall and Doris Roberts), and redneck Cousin Eddie (Randy Quaid) and his wife and kids. William Hickey (Corrado Prizzi himself!) joins in as an old relative with a bad wig and a daft wife. And through Clark mounting Christmas lights, buying a tree, sledding downhill, being stuck in the attic, perving on a woman’s cleavage, shouting at or hugging his relatives, chasing a squirrel and carving the turkey, nothing funny happens. Even Ozzy Osbourne is funnier. Starring: Chevy Chase, Beverly D’Angelo, Juliette Lewis, Johnny Galecki, John Randolph, Diane Ladd, E.G. Marshall, Doris Roberts, Randy Quaid, Miriam Flynn, William Hickey, Mae Questel, Sam McMurray, Brian Doyle-Murray, Nicholas Guest, Julia Louis-Dreyfus.